Enter the connection name, which is only used for identification purposes. Tick if you want to use the current user's domain. Enter a domain name if you want to use a custom domain, e.g. contoso.com. Tick if you want to use current user credentials. Enter a username for Active Directory authorization. Enter a password for Active Directory authorization. Tick if you want to save your password in the database. If the password is not saved, you will be asked to provide it whenever authorization is required. 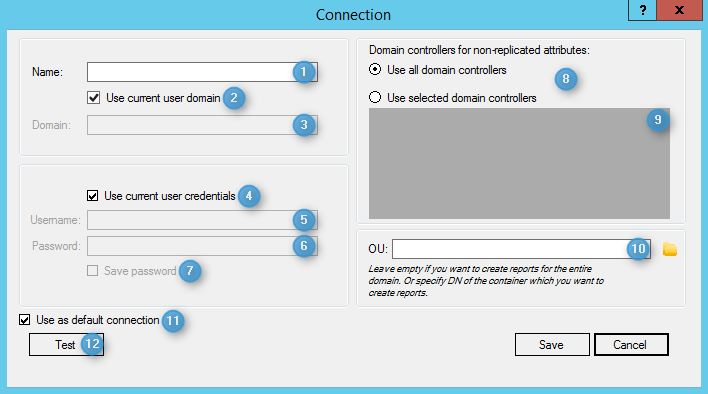 Choose if you want to use all domain controllers or just selected ones for report data gathering. Selected domain controllers can be used if some of the registered domain controllers are unavailable. List of available domain controllers. Tick which domain controllers you want to use. Used as report generation search root. You can provide a specific container for report generation. Tick if you want to use this connection as your default connection.